The Furniture Repair Centre. Why buy new if you can renew. Re-upholster - quality workmanship. Your fabric or ours. Transform your furniture into entirely unique pieces in a customisable and cost-effective manner – actively involving you each step of the way! Friendly & approachable, we pride ourselves on our excellent service and quality workmanship. 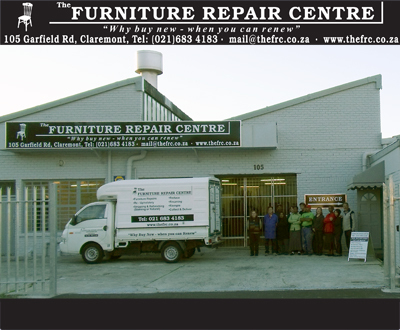 Whether it be repairing a sentimental piece of furniture or customising your very own piece, the Furniture Repair Centre offers a uniquely varied array of quality furniture services as well as an exciting new retail selection – F.R.C. Fashionably Rediscovered Collection. In fact, our skills are so varied we had to wait to put up the full website until we’ve collected enough pictures showing off our amazing work on your beautiful furniture! So come back soon to our new transformed website, featuring our best before and after pictures. If you want to learn more, get ideas or just have us contact you, drop us a line. This is how it works: All our clients receive a reference number on their invoice – come back to our website and click the view my photos button, type in the reference number and see all of the before and after photos of your pieces for you to view, save or e-mail to a friend! We offer the complete furniture solution under one roof, conveniently and safely situated in Claremont, Cape Town. With great service, quality workmanship and honest advice it’s no surprise we were a finalist in the 2008 Cape Talk / Nedbank Small Business Awards competition. ©Copyright 2009 Multilayer Trading 647 CC t/a The Furniture Repair Centre | All rights reserved.